John M. Perkins was born 80 years ago in the deep South. His mother died when he was an infant, his father left when he was a child, he dropped out of school after the third grade to work with his family of bootleggers, and he witnessed police shoot and kill his brother. Years later, John M. Perkins was the object of violent racism, and in 1970 he was almost beaten to death in a Mississippi jail. He had every reason to respond with bitterness, anger and rage. Instead, he forgave those who had tormented him and showed love to all. 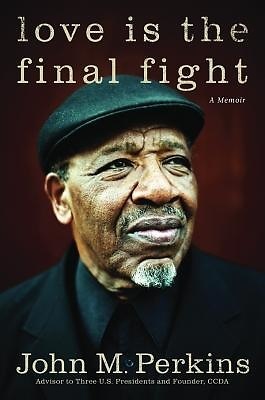 In the ensuing years, John M. Perkins has built a remarkable resume, founding the Christian Community Development Association, having a college reconciliation studies center named after him, consulting three presidents, serving on the board of directors of many organizations and having his book Let Justice Roll Down named one of the top 50 books that shaped evangelical Christianity by Christianity Today. As he approaches his 80th birthday, Perkins's pace has not slowed. He has launched a Mississippi Delta project to help revitalize a forgotten region. He visits young men in prison. He travels extensively to challenge people, particularly the young generation, whom he calls "post-racist." Whether teaching from the Bible or digging deep into his memories of the Civil Rights movement, when John M. Perkins speaks, people listen. In these new memoirs, he revisits the racism which was the crucible of his own life, peers deep into the power of love to overcome all evils and tells stories of the most unique characters you will ever meet. He stands up in the wake of Katrina, stands by his wife's side through the toughest days of their lives and casts a vision that has the potential to transform every city in America.